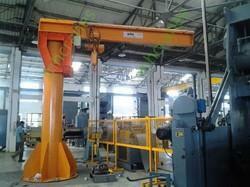 Manufacturer of a wide range of products which include pillar mounted jib crane and wall mounted jib crane. Post-mounted jibs can be constructed to provide a slewing angle 360°. Fixed jibs and monorail solutions may be appropriate for other applications. Wall Mounted Jib Cranes are available in a wide range of standard formats in capacities from 125 kg to 5000 kg. Larger specially designed options are available on request. We offer two formats of jib-crane, the pillar or post-mounted jib and the wall or column mounted. Each of these may be equipped with chain hoists or wire rope hoists with the additional options of electric travel and electric slewing gear. The jib arm may be under or over braced to maximize height of lift or travel.